The cooking grease that deposits itself on everything around including stoves, gas tops, ovens, equipment and walls can easily ignite. Most fires that occur in kitchens take place because of electrical faults. A lose wire from a cooking equipment or a shot circuit from over drawing power can be enough to cause a fire. Therefore, commercial kitchens require a foolproof fire protection system in activation at all times. A fire will permanently damage the business in terms of its reputation. Most restaurants that suffer a fire breakout either never make it back into business or find it impossible to cope with the lost time, cost and insurance liabilities .Because kitchen fires are mostly caused due to Class D or K fires (combustible metals or cooking oils and fats, respectively), fire extinguishers fitted into the protection system contain wet chemical agents. These chemicals when released on to the surface of the fire, distribute themselves in the form of minute droplets, creating an insulator coating. This cuts off the oxygen supply from the atmosphere to the source of the fire, thus, helping in cooling down the temperature and putting out the fire. 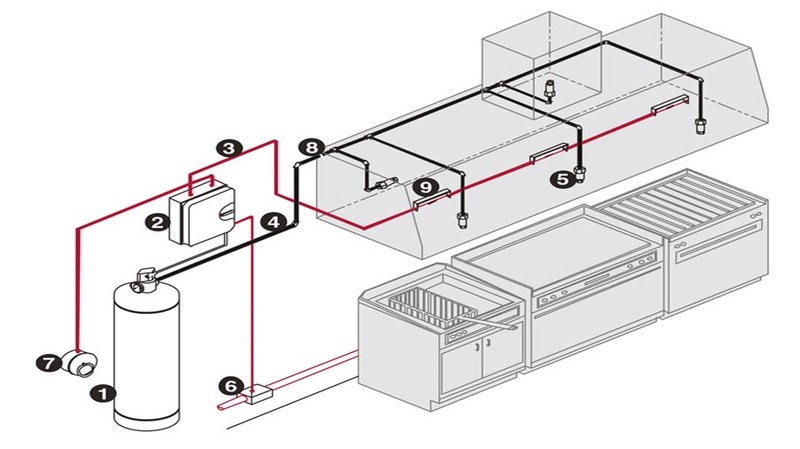 Some kitchen hood systems also have sprinklers which activate themselves when the heat or smoke detection sensors are exposed to enough smoke and heat. There are pressure valves attached to the sprinklers which open up to allow water to flow freely out of them in the surrounding area.dry chemical agents ineffective in cooling them down in case of a fire. The vegetable oil can be heated to a very high temperature. In case of a fire, it is hard to cool it down from its ignition point. That is why wet chemical agents such as potassium carbonate are used in kitchen fire suppression systems.